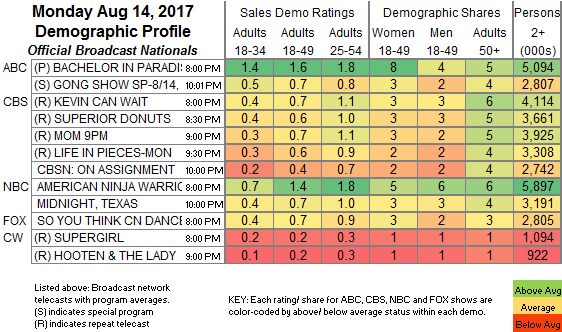 NETWORK FINALS: BACHELOR IN PARADISE gained 0.1 in final numbers, while THE GONG SHOW and MIDNIGHT, TEXAS lost the same. CABLE HIGHLIGHTS: USA’s WWE coverage notched a Monday cable win at 1.21/1.15/1.05, compared to last week’s 1.06/1.05/1.03. On VH1, LOVE & HIP-HOP was nevertheless up 0.02 to 1.15, with BASKETBALL WIVES up a tick to 1.05, and the debut of BALLER WIVES at 0.79. On MTV, TEEN MOM dropped 0.04 to 0.76, and SIESTA KEY was down 0.04 to 0.32. Bravo’s REAL HOUSEWIVES OF ORANGE COUNTY rose 0.04 to 0.61, and lead-out REAL HOUSEWIVES OF DALLAS returned at 0.33. On Discovery, STREET OUTLAWS gained 0.05 to 0.55, and CARSPOTTING ticked down to 0.26. On TBS, AMERICAN DAD fell 0.05 to 0.48, and PEOPLE OF EARTH was down 0.05 to 0.28. AMC’s PREACHER was steady at 0.36, and LOADED was down 0.02 to 0.05. 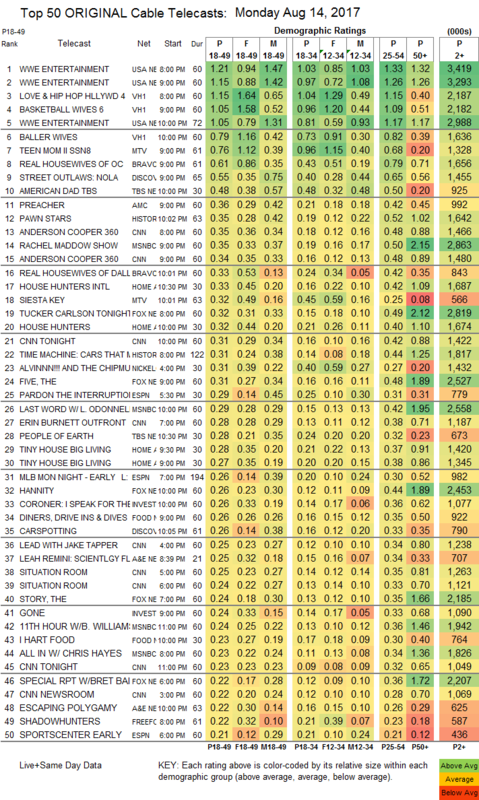 On History, PAWN STARS was at 0.35, compared to last week’s 0.34/0.33, and THE CARS THAT MADE AMERICA was at 0.31. CNN’s ANDERSON COOPER 360 and MSNBC’s RACHEL MADDOW SHOW tied at 0.35 in the 18-49 demo, although MSNBC was far ahead in total viewers with 2.9M vs 1.5M, while Fox News’s TUCKER CARLSON TONIGHT was at 0.32/2.8M. On HGTV, HOUSE HUNTERS INTL was steady at 0.33, HOUSE HUNTERS slipped 0.02 to 0.32, and TINY HOUSE BIG LIVING was at 0.28/0.27, compared to last week’s 0.29/0.29. On ID, THE CORONER eased by 0.02 to 0.26, and GONE was down 0.02 to 0.24. Food Network’s DINERS, DRIVE-INS & DIVES was at 0.26, and I HART FOOD arrived at 0.23. A&E’s ESCAPING POLYGAMY held at 0.22, and INTERVENTION was down 0.06 to 0.20. On Freeform, the midseason finale of SHADOWHUNTERS fell 0.03 to 0.22, and the midseason finale of STITCHERS was steady at 0.13. TNT’s WILL took at 0.05 hit to 0.08.